Discussion in 'Edged Tools' started by AK49, May 20, 2011. Gavin, SoreFeet, woodsmanjohn and 6 others like this. As a young, naive Rambo Fan I have to admit sheepishly that I had and adored one of those knives. From very early on though I had to teach myself how to retighten the nut that held the blade onto the handle. I also never used it for more than slicing fruit and looking cool. Nonc-Tobe, Winterhorse and Jonah L. Archer like this. What the heck is "molecular" stainless steel? Leshy_apprentice, Winterhorse and Jonah L. Archer like this. Wow ! Gotta get one of those ! "The best selling knives of their kind ever sold by us" - what more endorsement could anyone ever want. Leshy_apprentice, OrienM, PVF1 and 2 others like this. I had one too, the compass never worked right so I painted it to look like an eyeball.  Leshy_apprentice, Falcon45, Winterhorse and 1 other person like this. Leshy_apprentice, woodsmanjohn, GoodPhotos and 3 others like this. the 80's were some of my best memories...but I guess I missed this! oh well, I have enough other 80's stuff equally as wierd...like my florescent neon ski jacket I got in Europe. lol. I got this as a kid in a trade for a plastic squirt gun thing.. and I thought I was so awesome. I recently found it and laughed at it and that it was so important to me.. My SAK was better tool. As a kid something as Rambo as that is so cool.. I had a few of these. I'd buy another if I could find one. Just for the memories. woodsmanjohn and Winterhorse like this. I remember having one of those. I broke the lens over the compass and eventually broke the pot metal handle. It was the envy of all the kids though. I still have mine! The sheath was made of plastic coated cardboard and soon fell apart. It was fun while it lasted! Leshy_apprentice, Zaveral and Winterhorse like this. Yeah, all about 5 minutes! Did you try the number??? Leshy_apprentice and BushcrafterAU like this. man the memories of that knife. it was a total POS. but i thought it was the best thing in the world. You should drop by the Introductions forum, and say hi. It is glorious! Has anyone called the number yet? I remember my grandfather buying one at the flea market as a kid, and after trying to clean a rabbit with it, it just sitting on the shelf. What's the modern day equivalent of this POS? The Bear Grylls knife? Winterhorse and BushcrafterAU like this. I am gonna go out on a limb here and say that quite a few of us had one or more of those after seeing First Blood. The first movie that had a knife as a star. That brings back memories. My Grandmother would order all that kind of stuff for me when I asked. Nonc-Tobe, CSM-101, Kenneth and 1 other person like this. blind & lost and Winterhorse like this. Heck, the stuff they give you for free is worth more than the knife lol. Where them type of deals go? Oooh, that one has SPIKES! M.W. Gammill, Primordial, woodsmanjohn and 1 other person like this. I found one of these at a garage sale years ago and it still had the stone in the sheath. I also have to point out that you got to keep the sheath even if you returned the kife! What a deal! I never understood the point of the spikes on the guard of the Buckmaster, are they're really expecting us to lash this thing to a pole and spear stuff with it? I could have typed this verbatim myself. IIRC, they marketed the spikes to be used as a grappling hook. Never had one, but always wanted one. Hell, I still think the BuckMaster looks cool. That is hysterical. Imagine repeatedly chucking your knife up on a cliff to try and get those grappling things to catch? So over the top you can't help but love it! You gotta love that knife is worth $300 WITHOUT the spikes. I think they're just meant to be hand guards (the other knife someone posted said they're removable screw-on hand guards). 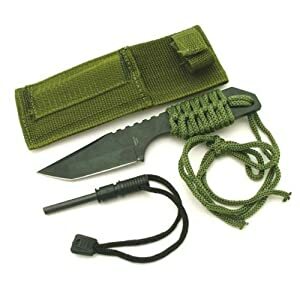 Not much survival use but probably a plus in knife fighting?? My uncle got me the Camo one they showed on the right when I was 5 or 6. That was probably my favorite gift that year. Back then it seemed as long as a machete does now. Only bummer about it was having to have a parent around anytime I wanted to look at it. Got lost in a move before I started collecting small knives as a kid. Good memories though. At least this part makes a little more sense than actually using it as a grappling hook for climbing or something. The design for the guard and the anchor pins came from Qual-A-Tec's association with the Seal Teams. The desire was for a way to use the knife underwater to anchor the swimmers gear to a pier or other underwater anchor point. "sometimes cheap things are really expensive... what i mean is, lighting a cigarette with a $5 note is very expensive.. why would you do that?? get a $50.00 gold plated lighter and you can light packet after packet. the saw is a piece of rough wire. the compass is inaccurate and the handle is brittle. the sharpening stone is so small its a joke, and as for the "leather" pouch, well mine is vinyl but still probably the most expensive part of the item. 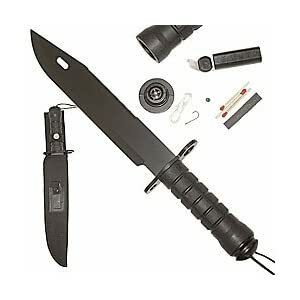 do i recommend it... of course, for your 10 yr old son to run around the backyard pretending to be rambo, hours of entertainment, he will think your the best, and the thing is such a piece of crap he wont be able to hurt anything with it.. "
Taken from an Amazon review. I am guilty of having one as a youth myself. I often wonder how many people actually got hurt using this silly thing! They are the best selling knives of its kind ever sold by us! It's a step up from atomic stainless steel. I got my kid a knife of this type back in the early nineties, I think it's still floating around the house somewhere. My friends and I went through a few of those as kids. We just couldn't figure why these tough "survival" knives kept breaking! I remember seeing ads for this knife or one pretty much like it in the back of my Boy's Life magazines (early 90's). I also remember thinking it looked like it had to be the most deadly and versatile knife ever made. 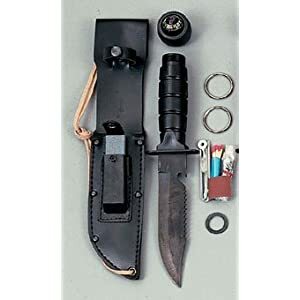 I had never thought about it before but it is ironic that an official publication of the BSA not only ran an ad for a fixed blade knife but a very shoddy and possibly dangerous one at that.